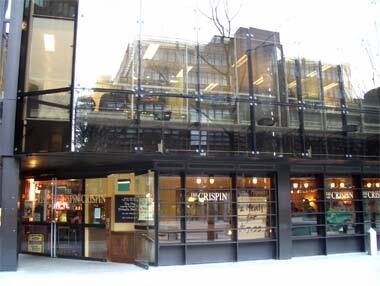 Very near to the northern border of the City, in the corner of Finsbury Avenue you will find the Crispin. Located on the ground floor of a modern office block the Crispin offers an excellent opportunity during the summer months to grab a beer and enjoy the hustle and bussel in the sunshine of Finsbury Avenue. Inside is pretty small, with seating to the left as you enter, on a couple of occasions I've been able to get a seat, which is easier in the summer months than the winter. Avenue allowing good use of the seating available to enjoy a cold lager.